App making technology has evolved over the years. Developers have been using native techniques and developing the hybrid versions too in order to get the things done more conveniently. But before I begin with telling you the difference between a Native app and PhoneGap/Hybrid app development systems, let me define both the terms for you. Native app development refers to the usage of native programming languages to build an app. For iPhone devices, the native programming language available is the new Swift and Objective C and for Android devices, the native programming language used is Java. Though both the technologies can create apps which are downloadable for both Android and iPhone, they have their own advantages and disadvantages over each other. Today, we are going to compare the both. Most of the mobile interfaces can be executed using both native app and PhoneGap app development techniques. However, PhoneGap/ hybrid app development technique provides more flexibility in designing the interfaces. 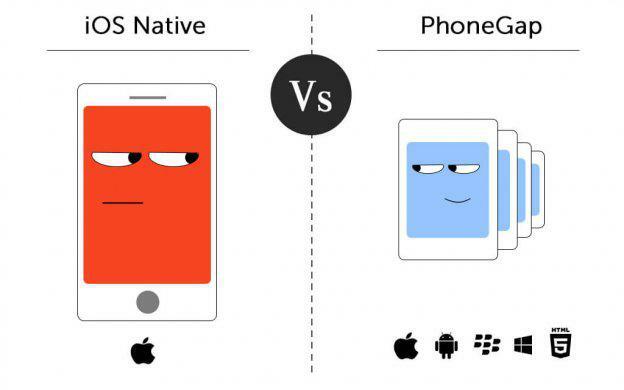 PhoneGap uses CSS3 and HTML5 and these platforms have better capabilities to design interfaces with extremely dynamic content and several form factors. However, it is a bit time consuming and tedious task to implement some particular standard native designs for user experience using the hybrid technology. The native app development technique provides design widgets and tools for creating some standard interfaces with user interaction feature which are not available using hybrid technology till now. Hence, native development technique makes creating user experience easier. Though both the technologies consume time depending on the level of complexities and feature requirements, hybrid is faster to develop because it can work on cross-platforms with minimal alteration in the coding. However there are certain features which are not available with hybrid development technique yet, hence in that case PhoneGap app development technique can consume lots of time. When it comes to user responsiveness, native apps tend to perform better as the user would not feel any loading time or difficulty while navigating. Whereas, PhoneGap apps have some issues on this front which causes delayed user interactions. For instance, scrolling seems more effortless in a native app while with hybrid a user might feel some delays while loading the frames. The same issue is faced while loading large animations with both the platforms. An app’s security system depends more on the experience and skills of the app developer along with the security level of the server that is being used. However, native apps have a better security environment to provide to the users while in PhoneGap apps the developer has to ensure that all the required security features are properly integrated. Since native app development environment has more tools to discover and debug an error, it is takes very minimal time and is easier to use for testing and fixing all the bugs. Whereas in PhoneGap apps, you will not find any reliable tools to identify and rectify the issues that are being faced so it might take a few hours for the developer to perform the job. The most attractive and useful feature of a PhoneGap/hybrid development technique is that the developer can launch the app on all the platforms including iPhone, Blackberry, Window and Android by building it just once with a technology like Adobe PhoneGap. Since both the app development technologies have their own pros and cons, you can choose which technique you want to adopt by analyzing you’re the requirements of your app. In simpler terms, if you want an app which can be developed swiftly then go for PhoneGap developing but if you are looking to provide the best user experience through your app then native technique is for you to adopt.